How do you define clothes that are part girly-girl, part gypsy, part surreal, and part God-knows-what? Disclaimer: This is a fashion post. If the idea of fashion offends you, do not read further. Also, it involves the delicate topic of different ethnicities and cultures. If you do not believe in ethnicity or culture please go away. On the positive side, I promise not to use the word "iconic." Not once. It really strikes me as strange that whenever it comes to "Black History" we are treated to the same parade of tired political activists and writers who seem to specialize in nothing more than anti-American sentiment as their main claim on our rather short attention spans. We almost never hear about black Americans who actually were really cool people—who did interesting and wonderful things regardless of their political views. Two examples—both fashion designers—immediately come to my mind. One was Anne Lowe (who designed Jackie Kennedy's wedding dress) and the other was Patrick Kelly. I still miss Patrick Kelly, who died twenty years ago. It's not that he was so unusual or brilliant or spectacularly talented, it was his humor itself that made him a genius. He had a way of making fashion fun for everybody, like a great party. A really far cry from the uptight Paris fashion giants, he wore denim overalls and a baseball cap to work. He sold plastic pin-on buttons separately from the clothes so that you could mix and match them according to your own whim. Also, you never could be sure that some of the off-the-wall combinations he came up with were the result of careful planning or just pulled from some bag of scraps he had lying around. Who cared? Part showman, part bagman, part businessman, his version of ethnic humor would never have survived the scrutiny of bias-hyper New Yorkers—which is probably why he ended up taking a one-way trip for Paris. Gain for them, loss for us. You should see the pins he had made as give-aways, and heaven help me—the stylized little black guy on his boutique bags! By golly, the Parisians couldn't get enough of it. I was a student at Parsons in Paris the year he became all the rage over there. The models would come to our design classes straight from his boutique where they spent their lunch money, wearing zebra-striped tube dresses, turquoise-sequined mermaid skirts and the world's CUTEST suit which consisted of a jacket that had more of a skirt to it than the skirt did. And they always came bounding into to our grungy studio CHEERFUL. That's a word I don't usually see next to the word "model" or "Parisian." I wasn't exactly the mini-skirt type, but I would have made an exception in that case of that suit with the skirt in the wrong place. It was just too funny to pass up. But like his other clothes, it was not funny in a nasty or cruel way, it was funny in a just plain old good-natured way. I think that is why scores of young women loved this guy's stuff. Did I mention the black dress decorated with colored billiard balls? or the one with the watermelon slices? I think I even remember one decorated with bananas. Okay, I draw the line at bananas. In case you ever wondered how one ought to honor a Divine infant if you are a Huron Indian, St. John de Brebeuf (whose feast day is today) had a few ideas. He was a Jesuit missionary who lived among them about four hundred years ago. Though he did not even remotely consider himself to be linguistically talented, he composed a dictionary of the Huron Language, a list of rules of etiquette for dealing with them, and most memorably, a beautiful little Christmas carol, known as the "Huron Carol." It has been translated to English and is quite lovely as such, but in its original Huron the language is even more gripping. De Brebeuf wrote it while he was recovering from a broken collarbone. If you are interested in hearing it sung in the Huron, I have only found one source for it. Canadian folk-singer Bruce Cockburn has a version I really love. Other than changing the rhythm somewhat, it is the same melody as the English version. Check out his "Christmas" album, this song is a gem and worth the price. Above: supplies used in goldwork and ecclesiastical embroidery, including silk, hammered gold and silver sequins, jewels, and gold thread. The egg-shaped thing in the upper left corner (top photograph) is a silkworm cocoon; the white cloud next to it is unspun silk. After the first lecture (mentioned previously) I had the privilege of visiting the convent of St. John Baptist in Mendham, NJ which was a cultural experience beyond my wildest expectations. We were able to see some of the most beautifully embroidered vestments, and even preliminary sketches and samples. The nuns are wonderful, and they have been custodians of some glorious illuminations and embroidery from the early 19th century, much of it done at the convent. Though they no longer do the embroidery, they are committed to encouraging the study and preservation of the examples they have. As a Roman Catholic, this experience was very moving to me. More and more I am discovering that the Catholic Church in America has almost no tradition of rich artwork, either musically or visually. Some have contended that this is because the American Church was almost entirely populated by poorer immigrants from Europe, especially Ireland. The Irish tended to associate rich vestments and glorious music with Anglican England, and as a result avoided it like the plague. I'm not sure if this is the main reason or not, but it is true that some of the best collections of sacred artwork (other than the "Munich glass" that still graces many church windows) are not found in primarily Catholic sources. Whenever I see such a beautiful collection so diligently cared for, I feel a tremendous sense of gratitude; sacred art is our salvation both culturally and theologically. The vestments in their possession mostly date from about 1890-1930. One was a cope representing the seven sacraments, each portrayed with an angel, on a circle about a foot in diameter. Picture a black velvet half circle about twelve feet across, decorated with seven golden discs each bearing an angel and a symbol of a different sacrament, and you have a pretty good idea of what it looked like. A cope is the elaborate cape used in celebrations and solemn processions of the Blessed Sacrament such as Benediction. Usually it has a separate piece (shaped sort of like a shield) in the center back which has a tassel on the lower point. I hope to have some books, kits and resources on hand, I will bring some stuff about the embroidery specifically, for those interested. "Behold, I will renew the face of the earth"
Easter Monday. The day after the Resurrection. THE RESURRECTION! As I drive past a graveyard, decked out with palm crosses, I can't help but think, I am so glad I believe in the resurrection. I don't know how people have the courage to survive without it. I don't believe it in some kind of vague way either. I know it is true. From my earliest childhood, I have just assumed the reality of the resurrection in exactly the same way as I took sunlight for granted. Perhaps I should say sunlight streaming through stained glass windows. I used to attend daily mass with my father at about 6:30 or 7:00 in the morning. I was very young, somewhere around four or five—before I was old enough to go to school. I remember how peaceful it was, especially on spring mornings after Easter. One of my earliest memories was of a priest who had died, and was being waked at the small chapel where we attended mass. It is only strange to me now that it didn't faze me in the slightest; It wasn't till I was older that I developed a fear and loathing of death and all other things scary. At the time however, I felt peace and perfect confidence that the old priest was being provided for in death, and it seemed to me to be an "all's right with the world" moment. It never occurred to me that death might be alarming. Easter Monday. Today I drove down to New Jersey to hear a talk by a married woman who hangs out with an order of Episcopalian Nuns and does embroidery with them. She brought a garbage bag full of old stuff that is used in ecclesiastical needlework. Gold. Silver. Silk. Linen. Precious metals and fibers. She told us how silk is a hollow fiber, and how it catches the light and reflects it. Why those elaborately embroidered vestments and altarcloths could catch the sunlight outside, and the candlelight inside and play games with it. 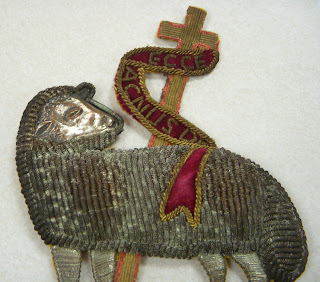 Sometimes a single element like the 4 inch lamb representing the "Agnus Dei" (shown above) would require the work of three different craftsmen; a wood carver to make the base, a silversmith to make a bas relief of details like the head, and an embroiderer skilled in the use of gold and silver threads to make the body. She talked about the balance in the lives of the nuns; and how similar their attitude was to some of the Asian needlewomen she had also had the good fortune to stitch with. Stitching was a part of their life, as was gardening and other chores. They stitched for the allotted time every day, then put it away until tomorrow. And tomorrow is always there for them! Many of them live to 90 or 100 years old. The close contact with nature afforded by the gardening chores gave an exuberance and style to their work that made the designs dance and sing. Let all the earth cry out to God with Joy! Later in the afternoon, I took the kids to a nature center for a hike. On the drive home, one of them spotted an animal she was sure was a fox; red-brown with "black feet and black tips on the ears" Figuring it was a longshot, I drove back to see if we could spot it again. 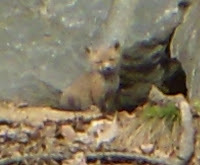 We looked and looked, and there, tumbling around the stone wall, was not one but six little foxes. 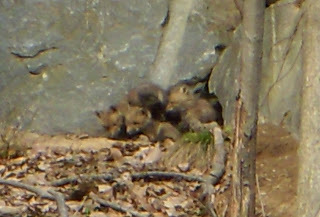 To be exact, it was one big and five very little pups. The big one ducked back into one of the holes in the stone wall, but the pups continued to tumble and frolic around—in and out of one of the many "doorways" in their house, looking for all the world like dead leaves tumbling in the wind. How appearances can be deceiving! We stayed and watched, turned around to get a better view and watched some more. How full of joy God's little universe is! I should mention that on the drive to the embroidery lecture earlier that day, we passed by something truly beautiful on the highway. It was iridescent reds and golds, splendor in the morning sunlight. I have never seen anything like it. I believe it was a dead wild turkey, as gorgeous as any peacock but decorated in rich golds instead blues and greens. How can something dead be so beautiful? I don't know, go ask the Redeemer. But I do know that that dead turkey is as much a sign of hope as anything can be; because I remember that shortly after I entered school I began to learn all about smog, endangered animals, and world overpopulation; how man was killing all of nature. Wild turkeys were one of those things that we were destroying. And now I see them everywhere, plentiful enough to find along highways, and also brazenly strutting around in the backyard of the very school where I first learned to be depressed about my own existence. It's taken me a long time to unpack that bitterness, and realize that the resurrection, The Resurrection, means I do not have to live in fear. There will always be a tomorrow, for wild turkeys, little foxes, and my beloved fellow man. All text and photos © Copyright 2009 High Tor Media, Inc.
Today is the Feast of St. Thomas Aquinas, perhaps the greatest theologian the world has ever known. Not unfittingly, today also the Church buried one of the greatest medical ethics experts of the twentieth century. I am personally rather sad about this because my husband and I used to moderate some marriage preparation sessions at St. Joseph's (Dunwoodie) Seminary in Yonkers. Msgr. Smith always offered the Mass and the final talk for couples attending the classes. We got to know him fairly well and were edified and frequently amused by his no-nonsense approach to moral theology, his devil-may-care attitude about what people thought, and his deadpan sense of humor. His tall, austere figure and rafter-rattling bass voice would have been kind of scary if you hadn't had the pleasure of enjoying his effortless appreciation of good things and small children, or hearing him casually toss off one of his legendary verbal granades—and then watch while yet another fascade of fashionable stupidity would be reduced to rubble—as he strolled through the beautiful marble halls of Dunwoodie on his way to deliver a lecture. On more urgent matters, whenever an ethics or moral theology question would come up, if you wanted the real answer you'd know to pick up the phone and dial Msgr. Smith. That went for reporters, lawyers, television personalities, priests and ordinary folks. He would in perfect clarity explain the Catholic position, and it always made sense. Perfectly. In an age of increasing fascination with frankenstein experiments (the usefulness of which is growing more questionable daily) he was instrumental in creating the field of medical ethics as a distinct science. If I could sum up his personality in one word, I would use the word "integrity." I am glad I got to know him at all, and as usual with the great men who walk around in our midst, I regret that I didn't know him better. Our kids always loved him, and from the choir loft, laughed at his sermon (it was more or less the same each time, but like a favorite story, that didn't stop it from being funny). He chose his words precisely, and sometimes punctuated his points with an ironic stare or cough that was enough to bring down the house. I shudder to think of the "theology-lite" that we may be stuck with now that he's not just a phone call away. It wasn't just his expertise, but also his strength of character that was so gratifying. You wanted to be on his side if you had any brains at all. Lately it seems that the most vocal moralists are all too full of opinions and lack the intelligence, time, or freedom from self-interest necessary to back up those opinions with diligent research and historical insight. I consider this effort part of basic intellectual maturity. On the other hand, I can't begrudge Msgr. Smith his reward. I would guess he is up there now, possibly sharing a few jokes or talking shop with Thomas Aquinas over a hot-toddy. In honor of these two great men, I recommend anyone interested in the fine points of moral theology read "A Tour of the Summa" by Msgr. Paul J. Glenn. This book is a very good short form of the Summa Theologica, and covers the main points of Catholic doctrine. As Msgr. Smith put it, the moral life is not a set of prohibitions arbitrarily imposed from without, but rather freely chosen actions which determine who we are. My Notes from "A Fairy-tale Christmas"